Urban Kitchen @Im Alten Hallenbad (Heidelberg, Germany) | Get Your Grub On! I was now nearly one week in Germany and thought it would be a good idea to try out some Asian fair around here. Together with two colleagues I went to the recently opened ‘Urban Kitchen’ at the location of the old swimming pool in Heidelberg. I didn’t see anything that was tempting on the menu so I gave their ramen selection a shot. They had some weird toppings on sale but the fact that they were offering miso and shoyu versions here made me curious. 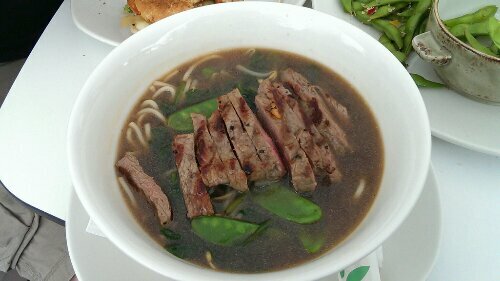 I ordered the ‘Shoyu Beef Ramen‘ and it actually looked quite nice with it’s dark broth and big slap of grilled beef on top. Taking my first slurp of the soup brought me back to reality and that Germany is rather a rookie in the art of ramen cooking. Sadly it was pretty tasteless, not salty whatsoever and probably not cooked for very long. The noodles were dreadful boring strings with no flexibility and springiness and tasted awful floury. All other toppings were quite okay, the snow peas were al dente and the steak even though a little out of place tasted pretty nice and beefy. ‘Urban Kitchen’ is a nice and lively place and my soup was okay and maybe a good choice for a light lunch or dinner but it was definitely nothing anywhere close to the mighty ramen. I kinda knew but still hoped for a decent copy of the real thing.